Germany's second largest airline, airberlin has just launched a new business class product on their short and medium haul flights providing travelers with a more cohesive travel experience when connecting from its long haul flights which offer business class. Starting this year as part of its strategic realignment, airberlin is introducing Business Class to its German and European flights resulting in a more consistent product experience on short, medium and long-haul flights for the first time. This gives business class travelers the added ease and comfort of a more uniform flight experience for their entire journey. On European flights the first row in the cabin is reserved for Business Class passengers. In addition to exclusive service, passengers will enjoy generous legroom, which at 32 inches (81 cm) exceeds the European Business Class standard. A further key feature of the new Business Class on European flights is the guaranteed empty middle seat, which provides a substantial amount of exclusivity and personal space high above the clouds. The premium service for Business Class passengers already begins on the ground: the benefits include, for example, a priority check-in desk, a security fast lane, access to lounges and exclusive waiting areas in the airberlin route network, as well as priority boarding. On board, the crew will give Business Class passengers a personal welcome and will serve a complementary drink. Passengers can then choose food and beverages ‘à la carte’ from the extensive on-board menu. Each passenger is provided with a pillow for additional comfort in addition to two pieces of baggage weighing up to 32 kg as well as two pieces of hand baggage weighing up to 8 kg which are included in the price of a Business Class ticket. The completely flexible Business Class tickets can be rebooked or refunded at no additional cost, and seat reservations are also free in Business Class. Members of airberlin’s frequent flyer program topbonus collect double miles for each Business Class flight, and can therefore reach a higher status more quickly, or keep their current status. On long haul flights the business class provides a high level of privacy, comfort and individual service. Every passenger has direct access to the aisle from the FullFlat seat which also has a massage function. Each passenger enjoys his own on-demand entertainment system providing over 200 hours of movies, TV programs, news, music and much more. airberlin is also adjusting its Economy Class service as part of the ongoing improvements in the service concept on short and medium-haul flights. Starting this year, airberlin will introduce a new buy-on-board concept and will offer its passengers a broad range of food and drinks to purchase. The regularly changing menu offers a rich selection of small and large snacks. New to the menu are combo offers among other products, which combine beverages and food like, for example, a hot drink with a Double Chocolate Muffin for 4.50 euro, or the Currywurst by Sansibar with a soft drink or a refreshing beer for 9 euro. In addition to popular classics like Currywurst, airberlin will also offer local products and food trends, such as BRLO craft beer from the Berlin brewery. BRLO has created a can especially for airberlin, which is only available on board. Of course, each passenger will continue to receive a Lindt chocolate heart when leaving the aircraft. The complete menu can be viewed at http://www.airberlin.com/airbistro. airberlin passengers can purchase on-board meals by the well-known Sansibar restaurant on the German island of Sylt on all flights lasting 90 minutes or more. Coffee and tea will also be provided by Sansibar in the future. New additions to the airbar selection include the popular trend cocktails “Hugo” and “Bellini”. The expansion in Sansibar products on board will again strengthen the partnership between airberlin and the popular restaurant from Sylt. “With the new on-board service, we are responding to the needs of our guests, who would like to see flexible products to suit every taste and price range. In this way, we will also be able to accommodate new trends and to offer seasonal products on board,” says Stefan Pichler. On long-haul flights, airberlin passengers in Economy Class will still enjoy the usual on-board service with up to two hot meals and free hot and cold drinks, as well as a selection of alcoholic beverages. A multiple-course à la carte menu from the gourmet restaurant Sansibar on Sylt will be served to Business Class passengers on long-haul flights. There will also be an ample selection of drinks. Berlin’s oldest distillery, MAMPE, created the FliegerCocktail exclusively for airberlin, which will be offered in three variations as an aperitif as an alternative to the traditional champagne. airberlin will open up Orlando as a new destination as of May 2017 with five weekly flights as well as additional frequencies from Boston, San Francisco, and New York. This flight will link Central Florida with one of Germany’s most important business hubs, Dusseldorf and provide travelers a central location from which to tour the region or Europe. The airline will also offer a new nonstop service from Los Angeles (three times per week) and San Francisco (four times per week) to Berlin, therefore being the only airline to operate nonstop flights from these two cities to the German capital. 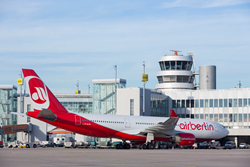 airberlin currently offers service from seven U.S. gateways which include Boston, Chicago, Ft. Myers, Los Angeles, Miami, New York and San Francisco. “With the expansion of inter-continental routes, we are further strengthening our position as market leader for flights to North America from both of our travel hubs in Berlin and Dusseldorf. With the connection between Berlin and San Francisco, we are confident of attracting lively interest from the startup scene in particular, while Orlando as a conference metropolis is mainly relevant to the business travel sector”, says Stefan Pichler. Flight tickets to Europe, can now be booked online at http://www.airberlin.com, at travel agencies, or by phone via the airberlin Service Center on 1-917-261-3165 (local rates apply). airberlin is one of the leading airlines in Europe and flies to 131 destinations worldwide. The second largest airline in Germany carried more than 30.2 million passengers in 2015. airberlin offers a global route network through its strategic partnership with Etihad Airways, which has a 29.21 per cent shareholding in airberlin, and through membership of the oneworld® airline alliance. topbonus, the frequent flyer programme of airberlin, is one of the leading programmes in Europe with more than 4 million members. The airline with the award-winning service operates codeshare flights worldwide with 23 airlines. The fleet is among the most modern and eco-efficient in Europe. Together with other airlines, airberlin belongs to Etihad Airways Partners, a new brand with which Etihad has been uniting shared activities since the end of 2014.